During the 1926-27 school year, E. Harlan Fischer, Frank Young, and James Carter would meet during lunch for prayer and fellowship at the University of California, Los Angeles. They looked forward to establishing a Christian club on campus, so Fischer sent out 35 letters over Christmas break. 16 men responded and met up at the Green Dragon Cafe on January 7, 1927. Those present at the cafe felt that a Christian fraternity, founded on Christian ideals and fellowship, would be more reputable than a Christian club. A constitution was drawn up and signed by 12 charter members on February 25, 1927. Nearly 90 years later, Alpha Gamma Omega is still thriving and committed to serving Jesus Christ. Thousands of men have served Christ at our chapters in California and Colorado, and now serve him around the world. 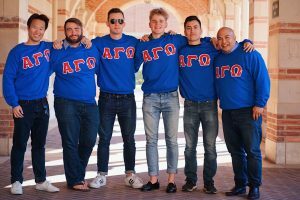 The Alpha chapter of Alpha Gamma Omega at UCLA is one of the oldest fraternities on campus, with a legacy of academic success and campus-wide recognition. From sweeping the annual Spring sing competition to Thursday night BBQ, Alpha Gamma Omega is widely active on campus and in our community. Through our studies and fellowship together, we make it our aim to actively pursue God and make his name known. “Study to show thyself approved unto God, a workman that needeth not to be ashamed, rightly dividing the word of truth.” – 2 Timothy 2:15. If you want to become apart of a lasting Christian brotherhood that has thrived for nearly 90 years, come to rush! Click the Rush button at the top of the page to find out more about this quarter’s rush events. We’d love to hang out with you, or if you have any questions about the whole rush process, please email us at pres@ucla.ago.org.